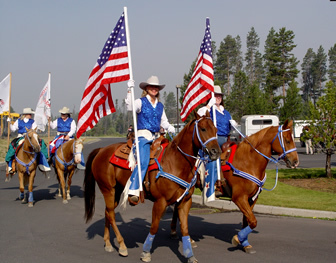 The La Pine Frontier Days 2018 Fourth of July Parade will be held on Wednesday, July 4 at 10:30am. Judging will commence at 9:00 AM SHARP. Entrants in all categories will be judged on their depiction of the Parade Theme only. There will be a $250 cash prize for the BEST FLOAT! Chamber of Commerce offices at 51429 Huntington Road NOON on Thursday, June 29, 2018. Parade begins at Memorial & Huntington (near St. Vincent de Paul) starting with the color guard. The route follows Huntington south to Third...Third West to Morson...Morson North back to Coach Road and the High School.